Efficiency translates directly into energy savings; the higher the efficiency of the turbo blower, the larger amount of energy savings. According to a recent EPA report evaluating energy conservation measures, “Turbo blowers are a significant area of innovation in offering energy savings”1 Additionally, “single-stage centrifugal integrally geared blowers have the advantage of managing air flow and pressure independently,”1 allowing intelligent control and improved functionality, as well as energy savings. 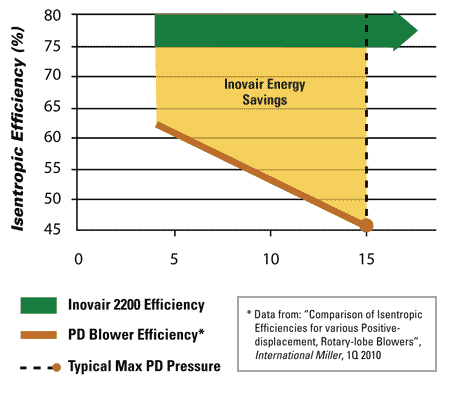 Inovair is leading the way in technology with best-in-class efficiency at substantially lower costs relative to other centrifugal blower technologies.